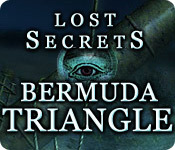 Lost Secrets: Bermuda Triangle is rated 3.6 out of 5 by 9. Rated 5 out of 5 by Alenee from Basic but funny. 4.5 stars! 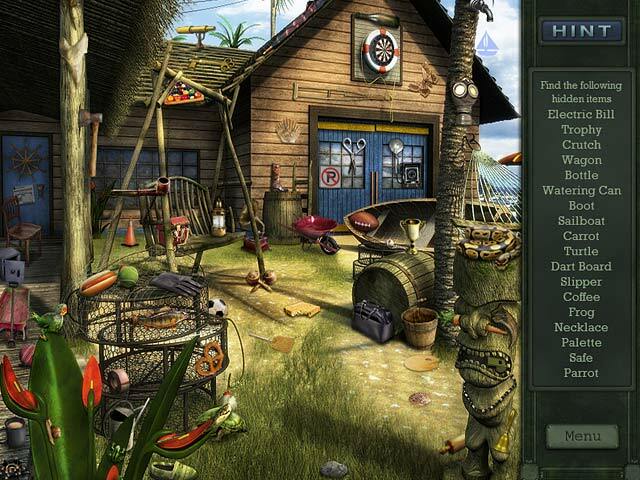 This is a game that harkens back to ye olden days of a couple of years ago, when HOA's were nothing but hidden object scenes, teamed with a storyline. Those games had zero bells or whistles but because of that, they put a LOT more attention into the tale. This one's a funny trek around Bermuda seeking old wrecks in the water. The tension between the explorer and her rakish captain are quite funny, and the answer to the mystery has yet to become clear to me (whereas in the majority of games these days, it's obvious from the outset). If you want to play a lot of challenging HO scenes and relax with some funny dialogue between each quest, this is a game for you... but if you're seeking treasure that's a bit more glitzy, you may want to test other waters. I recommend giving this game a try, either way! Rated 5 out of 5 by Snowview from Fun adventure, great story and locations A real adventure, not a horror story, with interesting undersea locations and a great story. HOS plus match 3. Rated 4 out of 5 by AverageSizeFish from Fun HOP Game This is an older game but the graphics have stood up well. The soundtrack is pleasant. There are no voice overs. The game consists mostly of HOS interspersed with written dialogue between your character and a handful of others. 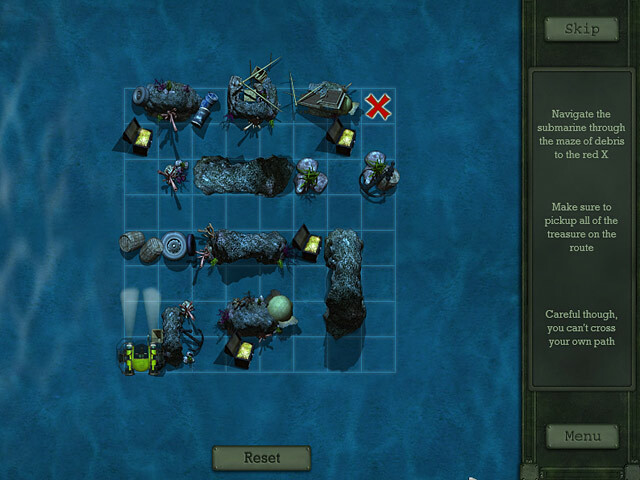 There are a few mini-games to round the whole game out. HOS are "junkpile" list finds and you return to the same locations several times. 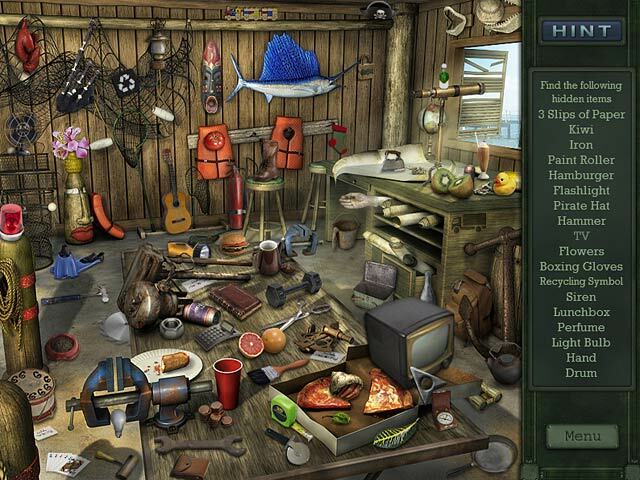 The items range from easy to moderately difficult to find. The story is light but fun. Overall this isn't a really sophisticated game but it's perfect for people who like HOS and want a break from the intricate, inventory-driven HOPAs that are pretty much all that's being made these days. Rated 4 out of 5 by merediffy from I'm enjoying it. I haven't completed the game yet, but wanted to review it anyway. I've been looking for HO games without the walkthroughs, strategy guides, etc. I've got all the BCA and AA games already, and was looking for something different. The graphics are great, most of the objects are right there in plain sight, but there are some that are quite cleverly hidden. I don't care about VO, I can read. I don't particularly care for the hint system, but that makes it more challenging for me. Overall I really like playing it. Rated 2 out of 5 by Rebr2009 from Almost only HOS I bought this game in 2009. Today would not buy. I tried to play again, but not stand it more than 20 minutes. Graphics and sound very good but very long dialogues without VO, ie, you spend much time reading. The few mini games are easy and HOS are not difficult too. Hint fills fast, but if you click more than 3 times wrong, it empties. Recommended only for HOS addicts. Rated 1 out of 5 by oldladyplaying from 3 clicks & you get punished with screen freeze! Have played many HOGs, but this is by far the most frustrating. I hate the scolding you get on so many games: it is insulting and degrading. Ok, maybe some devs don't want you to click yourself silly, but this one allowed THREE clicks (& spaced apart in time & around the picture) before the dreaded warning. Too many games out there for me to bother with this one.